Osvaldo (Eduardo España) gives his mother (Ana Ofelia Murguía) a reason to live in the black comedy Fecha de Caducidad. Films about missing children are as common today as unmotivated camera movements. Shake a cable box and at any given time you’re bound to find a couple. Few are about adult children and even fewer play for laughs. Only one has a Campbell’s tomato soup pumping through its veins. If you’re smart, skip this week’s mainstream gunk and catch Fecha de Caducidad when it opens Friday at the Media Arts Center San Diego’s Digital Gym. Fecha is being pitched as a thriller. In one sense, the pigeon-holers are right. After a summer defined by preachy teen comedies and further confirmation that former SNL players work best in eight-minute spurts, nothing is more thrilling than a delicious black comedy that’s geared for adults. You can’t judge Osvaldo’s (Eduardo España) corpse by its shoes. While being given a TV-side pedicure on the evening of his disappearance, his mother, Ramona (the outstanding Ana Ofelia Murguía), accidentally slips, leaving her 40-something, live-at-home baby with a crimson big toe. When Ramona visits the morgue to ID the body, director and co-author Kenya Marquez cleverly devises a way to keep Osvaldo’s bloody digit concealed. Fecha is neither whodunit nor howdunit; in this case, hipping the audience to Osvaldo’s death while a doting and clueless mom scours the streets of Guadalajara to find him twinkles with its own subtextual humor. A sympathetic morgue worker paves the way for a comedy of miscommunication with her suggestion that Ramona’s sloth-like offspring may actually be shacking up with a woman. Ramona solicits the help of a greasy goon (Damián Alcázar) with a picket-fence grin and hand-printed business cards, and a neighbor across the hall (Marisol Centeno) that she swears could have been her future daughter-in-law. 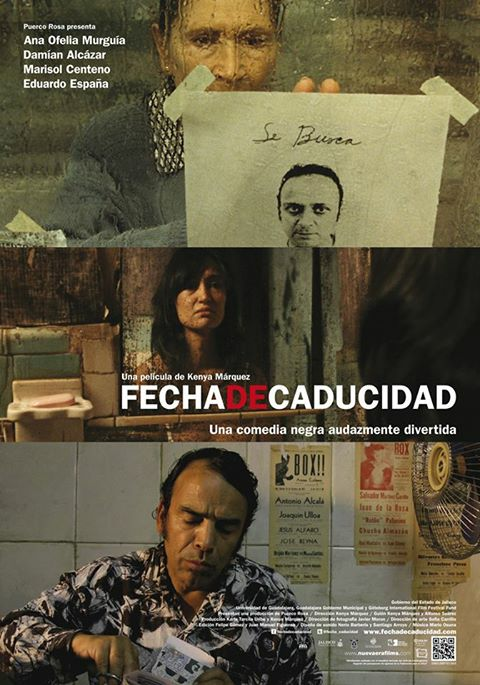 Fecha screened as part of last year’s Latino Film Festival. The San Diego Film Critics Society named it one of their top picks and it was my pleasure to be joined by two colleagues to help introduce the screening. Watching it again for a third time, I’m still dazzled by the film’s metaphoric (and gradual) use of Campbell’s tomato soup as a running motif. Like a vampire slowly sucking the life out of its victims, compulsive Ramona bleeds supermarket shelves dry of her son’s favorite condensed delicacy hoping beyond hope that he’ll come home and that she may once again return to a life of indentured motherhood.